Aurangabad – Ambedkar area - has arranged Janmasthami program. 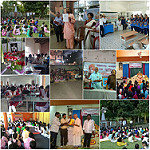 Adarniya Arun Joshi has honoured the occasion, Upasthiti 200. Meeting organized of VK Aurangabad Mahanagar on 23 August 2016, Upasthiti 37. Anna pooja & Gokulastami celebration at Sankarankoil - on 25.8.2016-Prithvi sthal-lord Shiva & Narayanan gave dharsan together to Gomathi Amba .... General secretary BhanudasJi,Annaji and local public,volunteers participated. Vivekananda Kendra Paschimbanga Pranta Bangla Prakasan Vibhag arranged a Sahitya Sabha at Bagbazar Gangateer Bhagabat Sabha on 21st August,2016. After the Shantipath and Geet the welcome address was delivered by Malabika Chatterjee(Bangla prakasan vibhag pramukh). She submitted the forthcoming programmes and plans of Bangla Prakasana vibhag. The first issue of Half yearly bulletin titled "Kendrabartika" was released by Hrisikesh Maharaj(Member-Museum finance committee Gaudiya Mission,Bagbazar). In his speech Maharaj shared his experience of publication of Srimadbhagabat Gita and the policy of distribution. Shri Nirmalya Bhattacharya (Prant Sampark Pramukh)put his views on publication drive. There was an interactive session with participants which was conducted by Prof. Rakesh Das,(Member of Prakashan vibhag). The programme was compered by Niloy Samanta(Member of Prakashan Vibhag). 26 people attended. VK Hyderabad Vibhag Chowmasik. Prant sah Pramukh Sri Prasanna and Vibhag Pramukh Sri Sudhakar Reddy. Personality Development Seminar" will conducted by VKK Brahmapur Branch (Odisha) with presence of Nagar sanghatak - Adarniya Renuka Didi, Yuva Pramukh - Sidharth Bhai, Swadhaya Verg Pramukh - Priyanka Didi, Sanskar Verg Pramukh - Preeti Didi, Chinmayee Didi, Chandan Bhai, Bikas Bhai, Balaji Bhai, Saroj Place - Roland Institute of Technology Date - 29/08/2016 From RIT, Principal Dr. T. C. Tripathi & Dr. Rina Rani Rath ma'am are present. Total 60 students are present. Laxminarayan DegreeVK ODISHA SEVA PRAKALPA conducted Swadhy Pratiyogita in Laxminarayan Degree college, pipila.Odisha Registered 65 Appeared 50. One of them Susanna attended pranta k.p.s.Also helped for registration of the students and conducting the exam smoothly. Cultural conference on 28.8.2016 at Ambasamudram, Tamil Nadu. Students show in divine form as Kanyakumari Bhagavathy Amman, Arthanareeshwara & Sankaranarayanan.